Dental bridges are designed to, as their name suggests, “bridge” gaps between teeth after tooth loss. This restoration consists of one or more false replacement teeth between two crowns. The bridge is attached to the natural teeth on either side of the gap, producing a strong and permanent improvement. 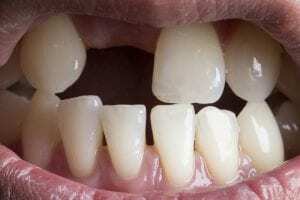 Full: Patients who are missing all of their natural teeth may opt for full dentures, which are designed to create the appearance of a full set of teeth. Partial: Men and women who still have some of their natural teeth can be fitted for partial dentures. These removable restorations consist of several false teeth that are typically held in place by an attached metal framework. Because other tooth replacement options are either removable or fixed to the existing teeth, they do not provide support for the jawbone. Dental implants are the ideal solution for tooth replacement, as they behave more like natural teeth than other restorations. A dental implant is surgically placed into the bone, preserving the integrity of the jaw and surrounding teeth. What Else Can I Do to Achieve a Beautiful Smile? To find out if you can benefit from professional tooth replacement, please schedule your dental consultation at the Palisades Dentists by calling 310.459.2303.